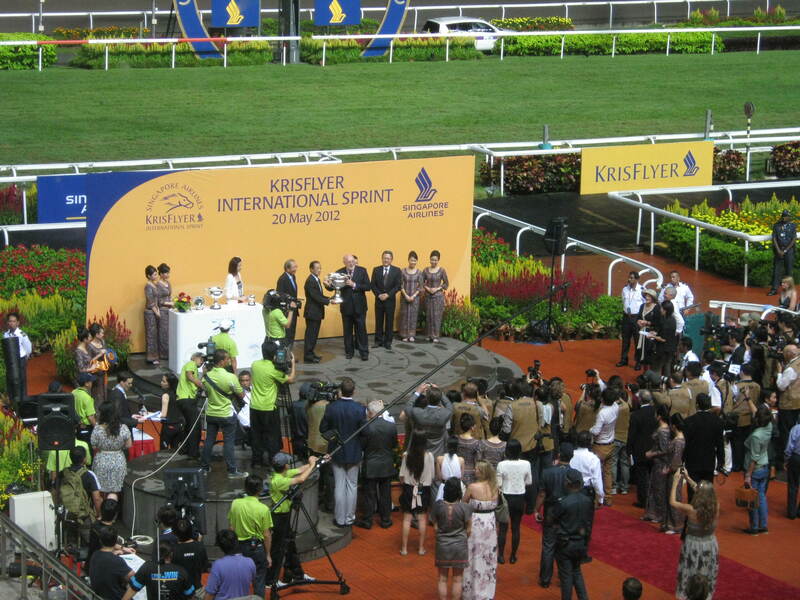 Okie, the Singapore International Racing Festival (SIRF) is an annual festival, organised by Singapore Turf Club (STC), that culminates in two prestigious races – SIA Cup & KrisFlyer International Sprint. But before the big day on 20th May, there is a month-long flurry of activities that aim to bring all the excitement of horse racing to the public. So you will get to enjoy the sight of beautiful Turf Belles (girls who were chosen for their beauty, wit and keen interest in horse racing), equine exhibition and even a horseshoe pitching competition! Ok, this is essentially STC’s search for its ambassador of the year. An island-wide search saw an overwhelming response from young ladies but they were eventually narrowed down to 11 beautiful young ladies. These Turf Belles, who would appear at all SIRF events, were dressed in a designer impression of the jockey skills that belonged to the past 11 SIA Cup winners. Here is another picture that I captured with my phone at the NEX Event Plaza on 13th May. That was the day they had their last chance to impress the judges and public voters with their beauty, poise, intelligence and public engagement via a fashion catwalk and Q&A segment! Well, Avena…if you ever read this post…I wish you all the best. You paint, you donate and you could even win cash moolah! STC also invited a couple of celebrities to their roadshows. Rebecca Lim graced the one at Tampines 1 on 6th May while Lin Pei Fen hosted the Turf Belle segment at NEX on 13th May. Lin Pei Fen, 933 FM DJ…she is quite pretty in person! Then again, this game requires a LOT of practice. I met the soon-to-be-champion, Mr Tommy Ho, who told me he created this mock-up of a stake at home and practised using his memento horseshoe he had gotten from a previous competition. I tell you…he is really damn good. Even the emcee constantly put him up as a good example of a horseshoe pitcher. Horseshoe Pitching Champion 2012! He defeated last year’s champion lei. Don’t pray pray! This is how you stand in order to pitch a ringer – which is a horseshoe encircling the stake stuck in a sandpit a short distance away. You can still score even if your horseshoe lands within 6 inches of the stake. Making great pitches can win you moolah! Again, don’t pray pray! Basically anyone who is over the age of 18, regardless of gender, nationality and religion, can participate. You don’t even need to buy anything. Very cool, right? That’s why you see really damn long queues at the first two roadshows where the finalists were being qualified. They should make this sport a CCA in schools or something. Quite fun to watch and play too! Now, I’m no horse punter but I’ve gotta admit that the atmosphere at the STC is quite something. Every time the horses are released from the barriers, the crowd went ballistic. Screams, shouts and fists pumping in excitement filled the air around me. The races were over in a couple of minutes but damn…the atmosphere was so infectious that it encouraged me to make a couple of bets too. LOL. Prize giving ceremony for the SIA Cup. Our President was there to grace the event too!